In 2003 I published an article about my experiments with "Ash" in mandolins (Coombe 2003). The conclusion was that although promising in terms of how light and responsive the mandolin backs were, problems with internal splitting and difficulty bending the sides made it impractical for mandolin backs. That experiment ultimately ended up in the fireplace because I found it impossible to bend the wood into mandolin sides without breaking. Subsequently I learned that what I had was probably not Eucalyptus regnans (Mountain Ash), but one of the other species of Eucalyptus that was marketed as "Ash" in Canberra at the time. "Ash" is now marketed as Tasmanian Oak or Victorian Ash (if sourced from Victoria) and consists of a mixture 3 species of Eucalyptus (E. regnans, E. obliqua and E. delatensis). It is very difficult or impossible to identify the species just by looking at the wood without specialized equipment, so one can never be certain what species it is unless the supplier has positively identified the tree when still standing. Ever since that article I have always had in the back of my mind the possibility of overcoming the problems, especially since the mandolin back I made was so light and responsive, and I had played a guitar made from Victorian Ash that was a very fine sounding instrument. So when I discovered a wide board of figured Tasmanian Oak in the woodshed of Monaro Timbers in Canberra, I bought it. The board was wide enough to make a one piece mandolin back and the tree must have been at least 150 years old when felled. I also discovered some nicely figured quarter sawn pieces of Tasmanian Oak in Bunnings and bought some of that as well. Some of the wood from Bunnings was subsequently used in loudspeaker cabinets, which gave me some extra experience with this wood. This experience showed me that some pieces do indeed have problems with internal splitting, especially if the board shows some splitting on the side, or the growth rings are not perfectly vertical. Internal splits will show up as voids on an end grain cut, and may not be visible on the face of the board so this can be a trap. These boards may be suitable for furniture, but they are not suitable for musical instruments. Other pieces had no internal splitting and I cut one of these pieces into mandolin sides and they proved to make quite acceptable sides. The wood was one of the more difficult woods to bend, but nevertheless it was practical to bend into mandolin sides with no breakages. Right from the very first note I thought the instrument sounded very promising. After a few weeks I was beginning to think that it was probably the best sounding oval sound hole mandolin I had made to date. This was quite a surprise since I have tried a lot of different woods in my mandolins, some of which were more than 10 times more expensive. Later I completed similar mandolins made from King Billy Pine/Blackwood, Carpathian Spruce/Big Leaf Maple and Carpathian Spruce/European Maple, so was able to make direct comparisons with 3 other mandolins. In every case I preferred the sound of the mandolin with the Tasmanian Oak back. It had everything I am looking for from a mandolin of that type - strong ring and sustain, clean and clear sound in the midrange and treble, warm bass and good bite and volume. In fact I think the clarity of the midrange and treble of that mandolin was probably the best I have ever heard in any mandolin. It had a sweetness and clarity that I usually only get from King Billy Pine and Blackwood, but this mandolin had a slightly cleaner sound and warmer bass than the King Billy/Blackwood mandolin I compared it to. I have never heard this before in any of my Spruce topped mandolins. So Tasmanian Oak was beginning to look like it might indeed be an excellent tonewood, but one mandolin may have been a fluke, so the only real proof is to make another. So I set to work on another mandolin made from the same woods (except for the pick guard), but this time it was an F sound hole mandolin. The result was once again a superior sounding instrument when comparing it to my best F hole mandolins made from European Maple. At first I had trouble deciding which mandolin I preferred, but after around 8 weeks of playing time I definitely preferred the Tasmanian Oak mandolin in every case, and I had some of my best Maple mandolins to compare it with. Maple gave a slightly drier quality to the sound, but the Tasmanian Oak mandolin had a cleaner and richer tone. The tone had similar qualities as the first (oval sound hole) mandolin, but of course with an F sound hole sound. Tasmanian Oak is indeed an excellent hardwood for mandolin backs, equal or even better than the very best Maple which is the traditional wood used for mandolins. However, it has proven difficult to get information about use of this wood from other Australian Luthiers, and I can only conclude that not that many have used it as a tonewood in an acoustic instrument. Being a Eucalyptus, some might be concerned with stability, which is a valid concern, but I have successfully used Jarrah in my mandolins (Coombe 1969) which is not known for high stability. One Guitar maker has responded very positively, so it certainly does work well in acoustic guitars, and there have been some examples of it being used in electric guitars and for necks of acoustic guitars. It does have the advantage of being cheap and readily available, and it is not so difficult to find figured pieces. I would encourage others to give it a try. You might be pleasantly surprised. I certainly was. 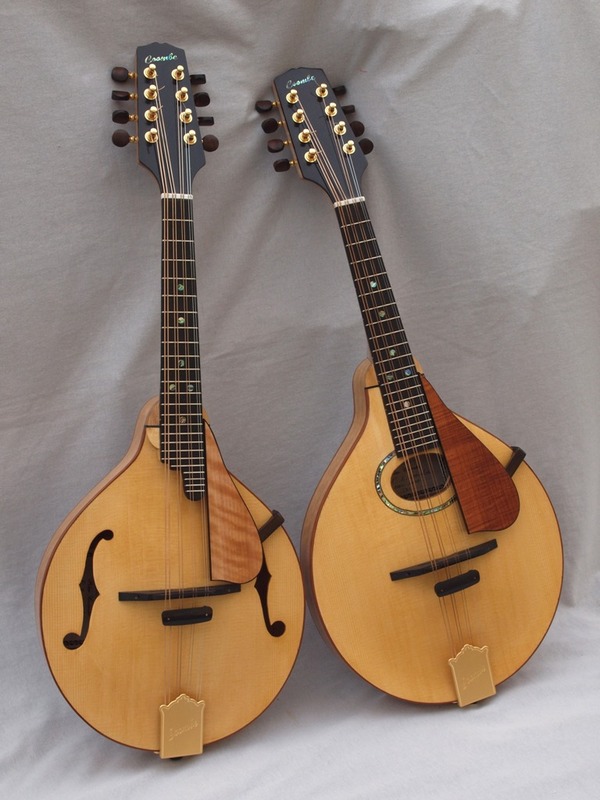 Picture: Two mandolins with Tasmanian Oak back and sides. Carpathian Spruce top, Queensland Maple neck, Myrtle bindings, Ebony fingerboard, bridge, and headstock overlay, Lancewood tuning knobs. The pick guard on the left instrument is Myrtle, on the right it is Blackwood.